Today was the perfect day for these lemon bars. If I'd been more ambitious, I might have made lemon meringue pie; but that wasn't happenin'. Lemon bars, especially these skip-a-couple-of-steps lemon bars, are doable on even a lazy day. I toyed with the idea of naming them Lazy Day Lemon Bars, but decided to go with Magical Meyer Lemon Bars. Either name fits because there's no zesting or juicing. Just slice up the lemon(s) and pick out the seeds and throw it in the food processor (or, maybe, the blender). You probably don't even need to pick out the seeds, but I wasn't in the mood for experiments today; I was in the mood for a surefire lemon dessert. The first time I made, or even heard of anyone making, a dessert with the whole lemon was when I was a young girl and my mother got the very first Cuisinart model on the market. Looking through the little cookbook that came with the machine, we got very excited about a cake that used the whole lemon. But on further reading, we saw that first you zested then you juiced; nothing novel about that. So we experimented and came up with our own cake that actually used the whole lemon. Lemon, especially Meyer lemon, is just about my favorite flavor of all time. I'll pass over the chocolate and go straight for the lemon dessert every time. And I love the sound of all the words that describe the flavor of lemon: bright, vibrant, zesty, zingy, tart, tangy ... Aaaahh. And, most important of all, it's perfect with a nice cup of tea! Oh, I almost forgot to mention that you must use Meyer lemons for this recipe. Using another variety of lemon changes everything. Other varieties are more sour and have a much thicker layer of bitter pith, so adjustments would have to be made. Whether you're saying 'welcome' to spring or 'good riddance' to winter, Meyer lemons say it well! What is your favorite dessert at this time of year? * To make crust gluten-free, just replace the unbleached flour with the following: 1/4 cup + 2 tablespoons sorghum flour, 1/4 cup + 2 tablespoons potato starch, 1/4 cup tapioca flour, 3/8 teaspoon xanthan gum. 1 Preheat oven to 350 degrees. Spray an 8x8x2-inch pan with cooking spray. You can also line the pan with one of these handy dandy 8-inch parchment squares with lifting tabs. 2 In medium bowl, whisk together flour, sugar and salt. Stir in butter and vanilla extract. Spread evenly in prepared pan, pressing crust about 1/4 inch up the sides of the pan. Bake at 350 degrees for about 25 minutes, or until well browned. Remove from oven; reduce heat to 325 degrees. 3 While crust is baking, start the filling. On a plate (so as to catch all the juice) cut the lemon(s) into 1/4-inch slices and remove the seeds. Place the lemon slices and juice in food processor (a blender might also work) along with the sugar and cornstarch. Process for 45 seconds. Let stand to macerate a little until crust is done. Note: I use a Cuisinart food processor. If you use a mini processor or a blender, it might take longer than the times given here. 4 When crust is done, remove from oven; reduce oven temperature to 325 degrees. Add eggs, butter, vanilla and salt to lemon mixture. Process for 30 seconds. Pour the filling over the hot crust. Bake at 325 degrees for about 22 to 25 minutes, or until it feels slightly firm to the touch. 5 Cool completely before cutting into bars or squares. Dust with powdered sugar just before serving. This changes everything...So yesterday I mentioned your marmalade post inspired me to can a Meyer lemon version. Not any more! This is my new inspiration. I love how you use a winter season citrus to bid winter goodbye by virtue of its bright, sunny flavor. Lovely work, Jean. Oh, Brooks, you are too kind! Thank you so much! My all time favorite treat when I visit a particular bakery is lemon bars. Thanks for this interesting recipe. Mildred, if you make the recipe, do let me know how it turns out for you. I'm sure anyone would be shocked, but I actually would turn down chocolate, even dark chocolate, if I had a lemon bar or lemon poppy seed muffin or lemon sorbet offered to me. I LOVE lemon, nice and tart lemon!! This sounds wonderful. I've often used the rind (peel?) of lemon in my sugar cookies. I love the idea of using the whole thing in this recipe. I'm pinning it - and substituting gluten-free flours. Now I need to track down Meyer lemons. Thanks! Judy, thank you! If you like 'nice and tart' you're going to like these bars! My recipe uses a fraction of the sugar some recipes out there call for. Sue, I'm so glad! Hope you enjoy your celebration! I've never heard of using a whole lemon in baking before...wow!!! Your bars look terrific and i'll have to give these a try when I find Meyer lemons next! Thanks, Liz! Hope you'll like them as much as we do! I too love sweet and tangy treats, Jean. Your lemon bars look marvelous. I was just talking about lemon bars just yesterday and how now, as an adult, I would even pass up chocolate chip cookies for them!! Love that you are using the whole lemon... it's definitely a great way to speed up the process! Thanks, Angie! And sometimes I make a gluten-free crust. Jenn, thanks! Isn't it funny how our tastes change throughout our lives? You had me at “Bright” – well, for sure with the Z-words. Zesty, zingy…zensational recipe. Lemon is to desserts what carbonation is to soft drinks. It slakes the palate, dissolves the cottonmouth, clears the deck for the mellow sweetness that follows. Then, it somehow comes back to linger and extend the treat. Then, of course, there’s the texture. All of it made perfect with a delicate crust, which acts a little bit like wasabi in mopping up the tang in preparation for the next bite. Z-words, yes, but let’s not leave out the T-words: Ting, Tang, Tingle and Texture. 5 cleavers! Aah, Sully, I thought you might like this one! It's always a proud day when I get "5 cleavers." Love your t-words and "zensational!" Yum,I love lemon too. (Not more than chocolate, but it's close!) I love new lemon bar recipes; this one sounds very lemony. Now to hunt down a Meyer lemon. Thank you Jean! Thanks, Melissa! I hope you can track one down soon. Greg, I love orange, too. And lime. And *any* citrus really. So refreshing! Next week I'll probably post my whole lemon cake, invented by my mother and me decades ago. Great photography - saw the picture had to read further. Lazy lemon slice would have got me too. I am all for little work great return especially in the kitchen. I like the idea of using the whole lemon - no waste great taste. Thank you so much! (Especially about the photography!) Years ago I knew a woman who said nothing she cooked took more than 15 minutes (active time) to make because she had decided no meal should take longer to cook than people were going to take to eat it! Oh these sound amazing. I too am a lemon girl. I like chocolate, but if both are placed in front of me...I choose the the lemon. Thanks, Bonnie! We lemon girls are so sweet we need something sour! "Magical Meyer Lemon Bars - Made with Whole Lemons"
Jean I read the above recipe and just couldn't get the following lyrics out of my mind. Donovan is a much underrated icon of the 60's but hey,stay mellow OR even yellow. Tony, you're such a hoot! Good to hear from you! I love your recipes - they are always terrific! Thanks, Bernideen! And a lot of them are great at teatime. Dori, thank you! Let me know how they turn out for you! Tomorrow I'm posting custard tarts. Do you ever make those? I love lemon! One of my favorite flavors (in sweets and cocktails). Meyer lemons are wonderful -- such sweet flavor. These bars look terrific, and help remind me that spring really will soon be here. I had one of those original Cuisinarts too (the one with the plastic base rather than the one with the metal base; same machine, just different bases). That machine really opened up all kinds of kitchen techniques that I had just reamed about (mushroom duxelle, anyone? Easy with the Cuisinart). Fun post -- thanks. Thanks, Kitchen Riffs! Ooh, I hadn't thought about duxelle in a long time -- think it'll turn up in something on my table real soon now! I don't make lemon desserts often, because I'm the only one in my immediate family who likes lemon. But our larger family is getting together for game night this week and I'm planning a lemon cake. If I had seen this sooner, I might have dared to try this instead. Next time! Thanks, Jean. Ruth, they are a lot quicker and easier than a lemon cake. 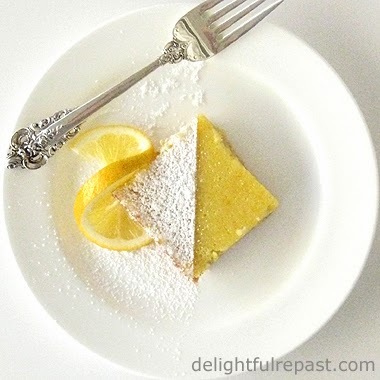 But I hope you'll try my Meyer Lemon Sheet Cake for that crowd you'll be entertaining. You know I said I'd make marmalade... well I did! It was so good... so nice to have marmalade in the house again. Thanks again for the inspiration Jean. Gorgeous looking lemon bars too... so sunny. Lemons are amazing aren't they... guaranteed to brighten a dreary day and make a sunny day sunnier! Charles, thank you. Yes, lemons are my sunshine! So glad you got your marmalade made. Feels good to have a good supply in, doesn't it? I love that you included the gluten free crust recipe. Thanks Jean! Thanks, Joanne! I hope you'll like the bars as much as we do. I had to come over and see the "magic"...and, oh my, they look delicious! I am intrigued by the fact that you use the whole lemon. I must try these...never hurts to add to one's repertoire of lemon recipes, right?